When the sun comes out in the spring and flowers bloom, one feels like learning new skills, trying new ideas. The same goes with the children and mine are no exception. Daily requests for crafting projects have certainly started to produce some results: little miss C. is learning the basic stitches and working on a felt teddy bear, and both girls are big on bead arts – so much so that I’ve no ordered some nicer beads and parts for Pandora-styled bracelets we are designing. As miss A. had her birthday party we decided to do something different for the goody bags and did some custom work for by creating something that they’ll treasure for a while: I found a company that does company gifts with very reasonable prices and got teddy bears wearing t-shirts printed with the school logo and then miss A. created a bead necklace for each bear with her friend’s name in it. She really enjoyed it a lot and the end-results was very pretty! I also ordered a bag of assorted key rings in various colours and the girls then designed and created little name-tag key rings that now hang in their book bags and the next bead project is already being planned. I have been positively surprised how dedicated and meticulous they have been with these projects from planning to clean-up and would definitely recommend trying out these ideas. Fun and satisfaction are guaranteed upon completion! My tip for finding the materials would be of course Amazon – almost anything can be sourced there and the price is always right – and often the shipping is free even on small purchases! This is where I found the letter beads on Amazon – an assortment of 1600 letter beads for less than a tenner! 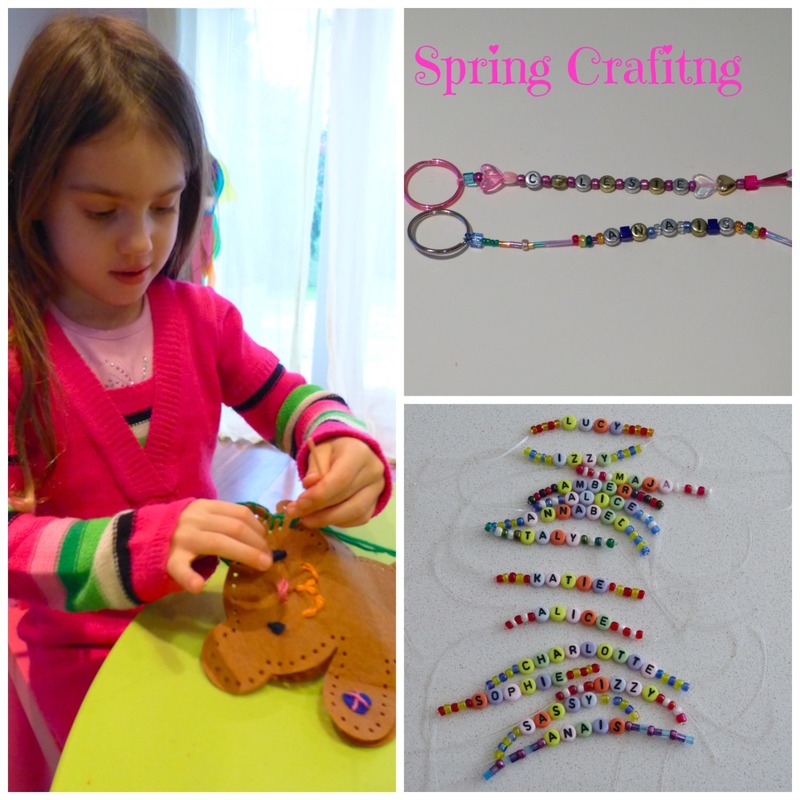 One Response to "spring is for new crafting projects"
Pretty keychains! Those are a great idea and I think we might thy them also. I haven’t thought about buying beads from Amazon before.